Dr. Bernice A. 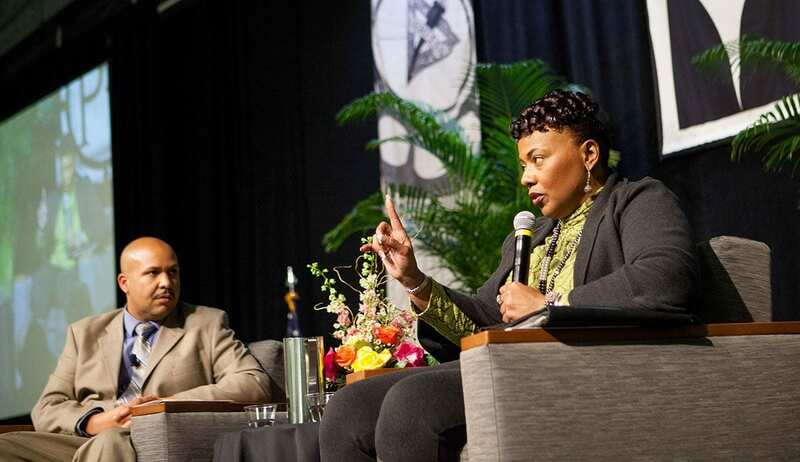 King speaks passionately about her father’s vision of non-violence at the Rev. Dr. Martin Luther King, Jr. Convocation. Dr. Bernice A. King, daughter of Rev. 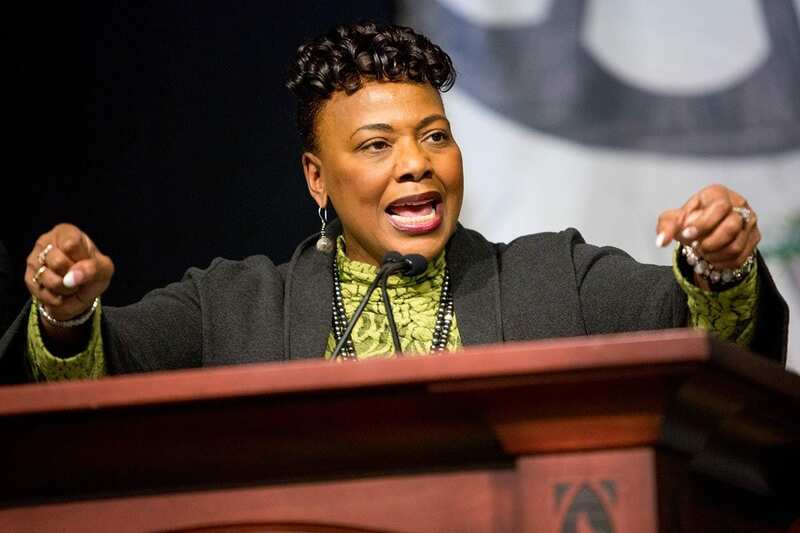 Dr. Martin Luther King, Jr., brought her father’s message of love, non-violence, and hope for a “beloved community” to 1,200 people who attended the Rev. Dr. Martin Luther King, Jr. Convocation in the Peterson Recreation Center at Providence College on Thursday, Jan. 18, 2018. 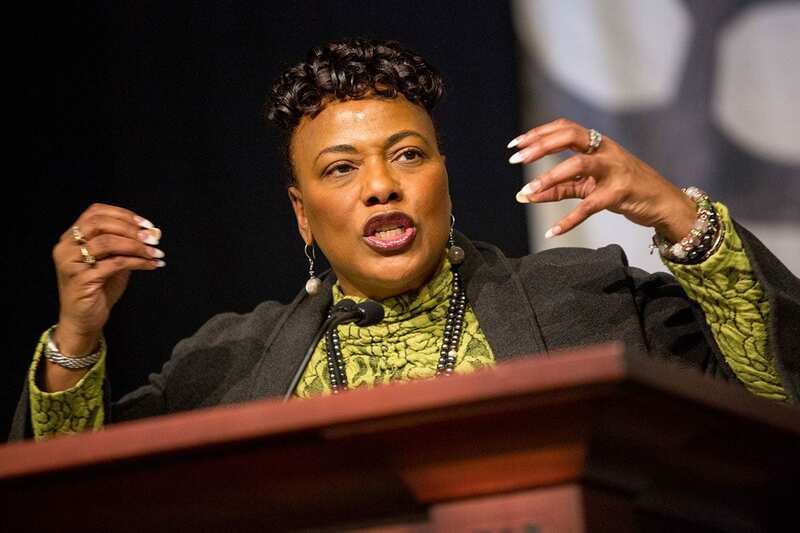 King is the chief executive officer of The King Center, also known as the Martin Luther King, Jr. Center for Nonviolent Social Change, which was established in Atlanta by her mother, Coretta Scott King, following her father’s assassination in 1968. An ordained minister and an attorney, she is a graduate of Spelman College and holds both a master of divinity degree and a doctor of law degree from Emory University. King was introduced by Phionna-Cayola Claude ’18 (Dedham, Mass. ), a psychology major who is the first student of color to be elected president of Student Congress. Claude said King embodies the College’s motto, Veritas, or truth, which is symbolized by a torch. King is “the living example of the torch her father once carried,” Claude said. King began by inviting the PC community to join The King Center in events commemorating the 50th anniversary of Dr. King’s assassination. Between Jan. 15, his 89th birthday, and the anniversary of his death on April 4, people are encouraged to engage in 50 acts of kindness or service, especially toward those of another race. At a March for Humanity on April 9 in Atlanta, “we will pause and really acknowledge and think about how we are members of one human race, a humanity,” King said. Her father’s goal was not simply to move people to act, King said. It was about changing people’s hearts, policies, systems, and institutions. “My father was holistically concerned about the human soul,” said King. Even in Dr. King’s vision of a beloved community, there is no such thing as an absence of conflict, King said. But everyone can agree to embrace non-violence, “not only as a tactic to be used in a social movement, but as a way of life, a way of engaging each other in society, and thinking about how we create policy,” she said. In today’s climate, we focus more on personalities than on issues and problems, King said. If we disagree with someone on several points, we simply shut them down. In the practice of non-violence, the goal is not to win a victory over another person but to win the person over, which requires a different heart and attitude, King said. Dr. Bernice A. King, responds to a question posed by Ralph E. Tavares ’01, assistant dean of undergraduate studies. Ralph E. Tavares ’01, assistant dean of undergraduate studies and director of multicultural student success, led a question-and-answer session with King, who offered encouragement to student leaders, including Fartun Abdulle ’19 (Lawrence, Mass.) and Adriel Antoine ’18 (Randolph, Mass. ), working to improve the campus community. King told the students to remember that Dr. King “never tried to take on too much at one time.” In his day, there were issues with voting rights, police brutality, economic inequality, and fair housing. People had grown discouraged and accepting of the status quo. He did not try to tackle all the problems but took on what was “realistically achievable.” In 1956, that was the Montgomery Bus Boycott. Black residents, inspired by Rosa Parks and led by Dr. King, refused protested segregated seating by refusing to ride city buses. Eventually, the U.S. Supreme Court ordered the city to integrate its buses, and that victory gave people hope, King said. Organization and education are keys to the struggle, King said. Students should realize that not everyone is “supposed to be on the front line.” There are roles for everyone, from organizing carpools to passing out flyers — and it’s OK to take a break once in a while. Dr. Francis P. MacKay, a founder of the MLK Scholarship Program at PC, holds the MLK Vision Award, accompanied by his wife, director of parent programs at PC, and their family. College President Rev. Brian J. Shanley, O.P. ’80 presented the first MLK Vision Award to the founders of the MLK Scholarship Program at PC. Within days of Dr. King’s assassination in 1968, Dr. Francis P. MacKay, associate professor of chemistry, and Dr. René M. Fortin ’55, professor of English, began soliciting contributions from faculty to establish a scholarship for black students. They were joined by Dr. Mark N. Rerick, professor of chemistry, and in less than one month, had enough money to award four scholarships in the fall. Eight more scholarships were established by the College administration thanks to Rev. Robert A. Morris, O.P. ’46 & ’82Hon., vice president for institutional development, who on March 21, 1968, had proposed that the College establish a pilot scholarship program for black students. Father Morris became the first director of the MLK Scholarship Program. Father Shanley said 700 scholarships have been awarded in the past five decades, including 105 to students now attending PC. 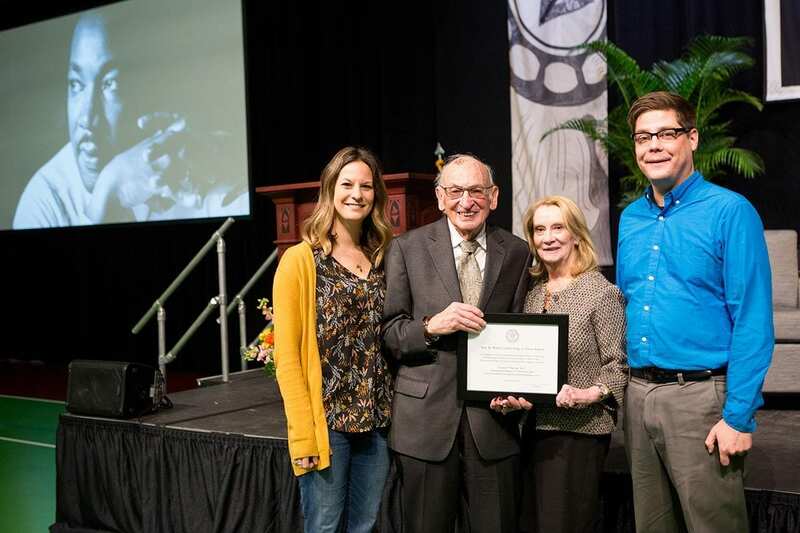 MacKay, who also served as a senior vice president at PC, attended the convocation to accept the award, which was presented posthumously to Dr. Fortin, Dr. Rerick, and Father Morris. Tavares, who was an MLK scholar, praised their vision.